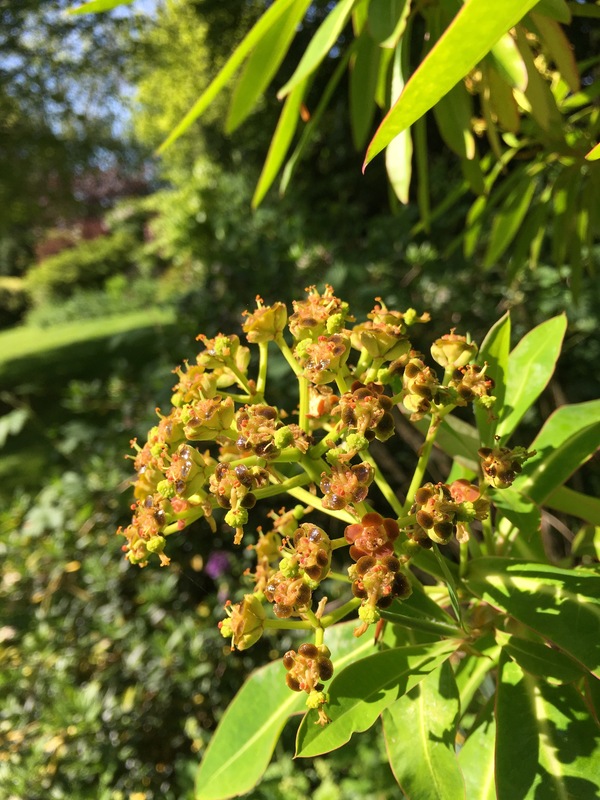 Glistening in the sunshine, Euphorbia Mellifera stopped me in my tracks today. Such a strong honey scent. You feel you could almost spread it on toast! No wonder it is commonly called honey spurge. Hardiness: Needs winter protection. I throw fleece over the plant in January. Best for: making a dramatic statement. An architectural or structure plant. Stands out in the border. Evergreen leaves with red edge and white central stripe. Warnings: not edible, despite the scent. Wear gloves as the milky sap is a potential irritant. ← Last chance to visit bluebell woods…..
I’ll have to be on the look out for honey spurge – or should that be sniff out? Our evening walk yesterday was lengthened by regular halts while we identified where the fragrances were coming from – magnolias and confederate jasmine, mainly. Sounds just like us Susan. We stood stock still last night in the driveway and turned this way and that trying to identify a gorgeous scent. It was a white Pom Pom viburnum. Such a wonderful scent. Wafting right from the other end of the front garden. Enjoy your evening walk tonight. It’s sunny here and the honeysuckle is just starting to flower. My Euphorbia has a very much darker leaf, starts flowering when things do where I live and goes on into October. It follows the same cluster pattern of flowers your picture shows and the same ‘health’ warnings apply. Yours sounds lovely too. Mine is ever so easy to propagate- I just stick a piece in the ground and it grows. I actually planted this in the front garden and somehow the seeds got round the back. The front garden one died over the winter, but the back garden one is thriving. Plants seem to just grow where they want to here. Thanks for reading and getting in touch. All the best with your garden. It is s great garden plant, BUT it does need a lot of room! WHAT a lovely website! Thank you, Karen for reading the introduction to “Song of the Nightingale” today. I am a poor gardener, but do have a lovely 2sd year rose garden. I will be back often to your site, as I have such a yearning for the Spring! Here in Atlanta the honeysuckle is in bloom, and the smell can stop you in your morning tracks. I will look for your honey spurge. We have two evergreen bushes in the front yard….that are big mushroom like works. They have a wonderful scent sometime in the summer, but the foliage is tiny, waxy unattractive flowers UNDER the leaves. I have grown to call this bush “Sweet Bush”, but I am sure that’s not its name. Would you be familiar with this Sweet Bush? Such a great plant and the bees love it too. I grow one against a shady east facing wall so they must be fairly tough. It’s full of bees today. The warmer weather has brought them out. I don’t think I have come across this euphorbia in the flesh, yet, Karen, but I am confident I would recognise from its scent when I do!